A new partnership between supermarkets and a savvy startup is saving consumers lots of cash, making the earth a greener place and keeping good food from becoming landfill. In other words, it’s a scavenger’s triple-decker dream come true. “While selling from the same open bin of apples that the grower sends to us may seem simple, it actually represents a significant departure from how things are normally done in the grocery business,” explains Andronico’s executive director of marketing Jonathan Packman. “By eliminating the labor cost and case packaging normally involved in merchandising apples, we can offer a much lower retail price to our customers. Phase two of the partnership involves “flash sales” on surplus produce that is already stocked in stores. 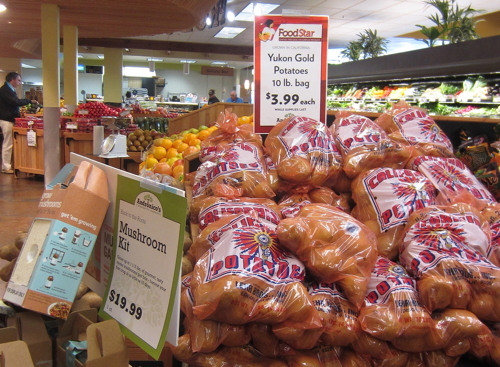 Such produce is placed in FoodStar bags and sold for fifty cents a pound, across the board. “Ron Clark, Food Star’s manager, has had a long-standing relationship in the produce industry in Northern California, and taps into his network to find solid ‘opportunity buys’ when they come up,” Packman explains. “He looks for recently picked crops that might be partially comprised of below-grade produce. This product is perfectly wholesome, but it may not meet the retail food industries standards for aesthetics. This is the type of opportunity that Ron seizes upon. “Both FoodStar and Andronico’s benefit financially, but aside from them and the consumer the real winner is society and the planet,” Packman adds. “By developing this innovative program, food waste is prevented, and this helps to keep food prices lower, while keeping food out of landfills. FoodStar expects to form partnerships with more supermarkets this year. The photograph above, showing the FoodStar bargain potatoes, includes yet another scavenging story. At the left of the photo is a rack of Back to the Roots mushroom-growing kits. These kits are the dreamchild of Alejandro Velez and Nikhil Arora, who were UC Berkeley seniors a few weeks away from graduation when they got the idea of home-growing mushrooms in scavenged coffee grounds. After growing an experimental bucket of oyster mushrooms on recycled coffee grounds in a frat-house kitchen, the pair raised interest from Whole Foods and Chez Panisse and garnered a $5,000 social-innovation grant from the UC Berkeley chancellor. Their first product was the Grow-at-Home Mushroom Kit that appears in this pic. Now everybody will have different objectives for their individual sites of course but successful blogs are pretty much measured by the same standards. Companies have come to realize there is a market for secondary blog software. 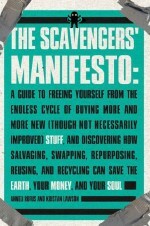 I just wanted to say, I came across the Scavenger’s Manifesto at the library a few weeks ago and fell in love with it. I also made the decision to change my name a few days ago and while I was Google searching articles on such I found a blog post by you by chance on changing your name. It was quite funny and also hurt my brain. Anyway, I thought it was a fun coincidence, OR NOT, if you don’t believe in those, and maybe we’re destined to be name changing scavenger buddies? You can come scavenge off my farm any time, it could use a reduction in junk piles.